Is it possible to gain 63 pounds of muscle in less than a month? What about 15 pounds of muscle in twenty-two days? By any metric such results would be phenomenal but few people believe such a feat is manageable. Yet in the early 1970s, Arthur Jones, creator of the Nautilus machines, claimed it was possible through his own brand of High Intensity Training (HIT). What’s more, he claimed he had scientific backing for his claims. So what exactly happened during the Colorado Experiment conducted by Jones and was he telling the truth? Have strength enthusiasts been selling themselves sort by setting low targets for muscle gain? After all if such training can yield 15 to 63 pounds of muscle in one month it must be worth doing. Jone’s goal in conducting the experiment was to gain publicity and credibility for his particular type of High Intensity Training. As detailed by Randy Roach in ‘Muscle, Smoke and Mirrors’, Jone’s advocated a style of training that many in the bodybuilding industry were uncomfortable with. Jones maintained that a high intensity was required for optimal muscle building and promised that short bursts of high intensity interval training could produce remarkable results. 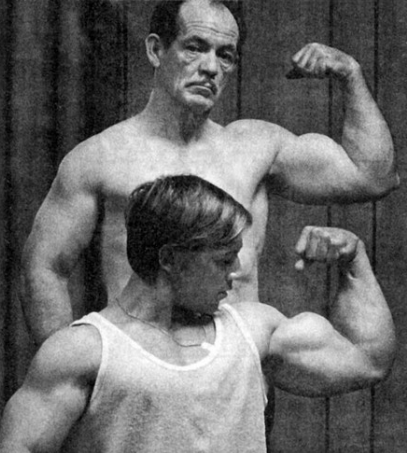 An anecdote from the 1970s often told to demonstrate the intensity of Jone’s training was that renowned bodybuilding Champion Arnold Schwarzenegger couldn’t finish a workout with Arthur Jones because it was too hard. To prove that very brief workouts are capable of producing rapid and large scale increases in muscular mass and strength. That nothing apart from a reasonably balanced diet is required. That the so-called “growth drugs” (aka steroids) are not required. Jones himself was a very outspoken and often disliked voice in the fitness industry. He had a poor opinion of the general consensus on fitness and was not shy about it. In numerous interviews, seminars and publications, Jones would regularly take pot-shots at others in the industry for using false claims and unsound training principles. Take steroids for example. Jones held the view that drug use hindered rather than enhanced muscular growth and strength. In many ways he was a voice for those uncomfortable with the shift towards steroids in training that swept across the US (and most of the Western world) from the middle of the 20th century. For Jones what really counted was genetics and training. It couldn’t be any old training mind you, it had to be intense. Once such rules were applied, results would come. Or so it was promised. In May 1973, Arthur Jones and Casey Viator began their training under the watchful eye of Dr. Plese. Everything they did would was monitored from their training to their eating patterns. It would be a month of training, eating, recovering and very little else. True to his word, Jones made sure they were put through their paces. In his 1999 autobiography, Viator described how Jones would often sit in on Casey’s training sessions and use a variety of tricks, including outright insults, to ensure Casey didn’t hold anything back. So the training was not only intense, it was supervised by a trainer who had no compulsion about a tough love approach. What were in the results? In September of that year, Jones publicised the results in Ironman magazine. An abbreviated version is posted here. The following is a brief, preliminary report of an experiment conducted at Colorado State University in May of 1973. Location . . . Department of Physical Education, Colorado State University, Fort Collins, Colorado. Supervision . . . Dr. Elliott Plese, Director of Exercise Physiology Lab., Colorado State University. It should be clearly understood that neither of the subjects was an “average” subject, and there is no implication that subjects of average or below average potential will all produce equal results from a similar program of exercises. Casey Viator has trained on a fairly regular basis for a period of several years; with barbells and other conventional training equipment until June of 1970, at which point he placed third in the Mr. America contest and with both barbells and Nautilus equipment until June of 1971, when he won the Mr. America contest. From September of 1971 until September of 1972, he trained primarily with Nautilus equipment with limited use of a barbell, primarily the performance of barbell squats. 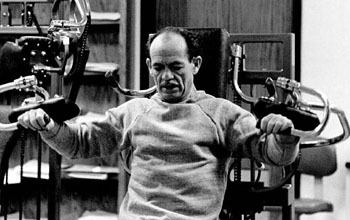 From September of 1972 until December 23, 1972, he trained exclusively with Nautilus equipment limiting his exercises to “negative only” movements. At the end of that period of training he weighed 200.5 pounds. In early January of 1973, he was involved in a serious accident at work and lost most of one finger as a result and almost died from an allergic reaction to an anti-tetanus injection. For approximately four months, most of January through April of 1973, he did not train at all; and since his level of activity was low, his diet was reduced accordingly. During that period of four months, he lost approximately 33.63 pounds but 18.75 pounds were lost as a direct result of the accident and the near-fatal injection. So his loss from nearly four months out of training was only 14.88 pounds, less than a pound a week. The second subject (the author, Arthur Jones) has trained on a very irregular basis for a period of thirty-four years … and reached a muscular bodyweight of 205 pounds at one time, nineteen years ago. The author did no training of any kind for a period of approximately four years until late November of 1972 and then trained on a fairly regular basis in the “negative only” fashion for a period of approximately six weeks. Training was ceased entirely in early January of 1973 … and no training was done again until the start of the Colorado Experiment. The author’s bodyweight has varied from approximately 145 to 160 over the last ten years briefly reaching a level of 190 at the end of approximately six months of steady training that was concluded four years prior to the start of the Colorado Experiment. So both of the subjects have demonstrated the potential for greater than average muscular mass and both subjects were rebuilding previously existing levels of muscular size. Despite the predisposition of both men for muscle building, Jones seemingly left no doubts his form of training was effective. In fact he claimed both men had achieved such massive gains with workouts averaging 25minutes. 1) Replicability: The Colorado Experiment has never been repeated apart from individual cases by interested trainers. The whole point of the experiment was to gain scientific backing for High Intensity Training and the fact that no one has been able to repeat such results, or even a fraction of them, in a large scale study has hurt Jones’s findings. Jones did conduct another experiment, the ‘West Point’ experiment, using his form of training but finding the exact results from the study have proven difficult. 2) Selection Bias: Both Casey and Arthur had previously trained with weights before. Viator is famed for his amazing genetics and predisposition to muscle building. Likewise Jones had built a solid 190 pound physique years prior to the experiment. Many have speculated that the gains both men experienced came as a result of muscle memory (a physiological phenomena which makes it easier to put back muscle or strength that you lost). 3) Dirty Tricks: This is perhaps the most prevalent claim made against the experiment. Prior to the experiment Casey had lost over 40 pounds due to an allergic reaction to a tetanus shot. Coupled with such a hugh loss in bodyweight, roughly a month before the experiment Casey ate a restricted diet of 800 calories. This has led people to suggest that Casey’s staggering weight gain was due to a severe bounce back to his true size. Other criticisms of the experiment have suggested that Casey took steroids during the experiment, something he denied until his death in 2013 or that Jones manipulated the results prior to publishing. So was the Colorado Experiment a sham? Several members of the Denver Broncos Professional Football Team visited the lab for the purpose of observing the workouts, and then started training in an identical fashion during the last two weeks of the experiment . . . after the experiment, the Broncos placed an order for several Nautilus machines and drastically reduced their previous training schedule. And while we were training in Colorado, members of several other professional football teams were training at our facility in Florida. . . in an identical fashion, three brief weekly workouts involving only one set of approximately a dozen exercises, with as much emphasis on the “negative” part of the work as possible. One member of a Canadian professional team became so strong in the pullover exercise that he was using 675 pounds for several repetitions in good form . . . having started two months earlier with 275 pounds. Lou Ross of the Buffalo Bills added 20 Pounds to his 6 foot, 7 inch frame … cut a full two-tenths from his already fast time in the 40 yard dash … added five and one-half inches to his high jump … and doubled his strength in many areas of movement. These figures having been provided by the Buffalo Bills coaching staff, who tested Lou before and after a two month Nautilus training program in Florida. Mercury Morris of the World Champion Dolphins weighed-in 7 pounds above his previous highest weight and still ran the fastest 40 yards of his life when he was tested . . . following two months of Nautilus high-intensity training. If one wants to learn about the real success of the Colorado experiment, the athletes mentioned in passing are perhaps the best case studies. Casey and Jones knew they would experience great results from the training, the athletes did not. So there’s a chance it wasn’t all ‘smoke and mirrors’, however small. The Colorado Experiment is still shrouded in controversy. Some in the fitness industry cite it as proof that Jones’s methods were worth their weight in gold, others as proof that Jones was a trickster. Like so much else in the fitness industry, it’s up to the individual to believe in it or not. I played college football at Penn State in the early 1980’s. I was a highly recruited player (in the same recruiting class and Parade All America team with John Elway, Dan Marino, Jeff Hoffstetler, Eric Dickerson and RB Curt Warner to name just a few) and a big reason that I chose to accept a scholarship to play at PSU was the strength and conditioning program that was run there by Dan Riley. Riley came to PSU from West Point and was involved in the West Point experiment. I had already read about it (by the way, there was a book in which the results of the West Point Experiment were published) and in high school I spent periods training with the standard “Periodization” Approach- multiple sets, heavy weights & not much focus on the character of each repetition and the High Intensity Training “HIT” approach advocated by A. Jones and Dr. Ellington Darden. I am a firm believer in science (I went on to earn a Ph.D. in Geology & Geophysics from Rice University) and at that time I did not find the quality of support in the scientific literature for the “Periodization” Approach as I found for the principles behind HIT. The nature of the strength training of a college football program made a big difference to me. Consequently, I chose PSU over Notre Dame (who had no strength training program then), Nebraska (home of the Icon Boyd Eply, who was an advocate of Periodization), Alabama, Ohio State, UNC (all Periodization programs) and many others because I felt that the best way for me to meet my potential was through a great strength program combined with great coaching in a pro-style offense. Of course Joe Paterno’s “Great Experiment”, the philosophy that big-time football and high caliber academics could and should co-exist was also a tremendous attraction. The information above was background to establish some credibility for the observations I will provide. These observations support the author’s point about how the results cited by NFL players, who tried the HIT approach, serve as replication of the results of the Colorado Experiment. In my time at PSU, I saw results that supported Jones’ assertions. A few examples that I saw involved players in the class a year ahead of me. During my recruiting trip in January of 1979, I met 3 players who would go on to be 1st and 2nd round NFL draft picks (two 1st rounders and one 2nd rounder). At that time they all ranged between 6’1″ and 6’3″ in height and weighed between 225 and 235 lbs. in high school all three had played fullback and defensive end. When I came back in late April to visit for a spring scrimmage, I learned that their weights ranged between 240-245 lbs. and when I reported for pre-season practice, in August, there weights ranged between 245-255 lbs. and all three ran faster 40 times than when they weighed between 225-230 lbs. At that time these guys were playing Offensive Guard (2 of them, both starting) and the other was a back-up inside LB, who was starting as a DT before the season ended due to injuries and his continued growth. By the time the three finished their senior years, all three played at 265 lbs, with the fastest running a 40 yard dash in 4.6 sec. and the slowest ran 4.85 sec. They could have been larger, but our line coaches restricted them to no more that 265 lbs. because they believed that if the weight wasn’t muscle, it was unnecessary baggage. During their last season we played teams with bigger guys like the USC Trojans and I remember watching the two OG’s literally beating the DT’s across from them, almost to death. In that game, our RB, Curt Warner finished the game with more yards than the Heisman Trophy winner Marcus Allen (who did not break 100 yards that game). That was a tribute to how dominant our O and D Lines were in that game and a big reason for that was our HIT strength and conditioning. The reason that PSU adapted HIT for strength and conditioning was multi-fold and it fit perfectly with the philosophy of the program. Paterno’s recognized that for his “Great Experiment” to succeed, guys had to have time to get everything done. We had to use time efficiently. I recall that before each practice, the schedule for the practice was posted for all to see and it was broken down into 30 sec intervals and usually ran for about an hour and a half (rarely ever approaching 2 hours). Because time was a premium, we never did anything that did not have a clear and direct link to the game. There were no Mickey Mouse drills and conditions came from us sprinting between drills and our strength training (because the high cardio demands of HIT). We ran after practice only 2 maybe 3 times a season. The HIT approach fit nicely with the desire for efficiency because during the season we lifted only 2 times a week (to avoid overtraining) and each session took no more than about 35 minutes to complete. During the off-season we lifted 3 times a week, with each session lasting no longer than 40 minutes. Another very desirable aspect of this approach is that we never used or approached maximum weights during lifting sessions because Riley also emphasized safety and exercising in a manner that emphasized proper technique to avoid injury. So HIT yielded many benefits for PSU football. We saw amazing growth in muscle mass and strength and speed, minimum time expended in the weight room, leaving more time for meeting and academics and almost no injuries occurring during strength and conditioning. Now I realize that some could take me to task for only citing 3 guys, but these 3 guys were just examples of what occurred with a number of guys. The point that Jones makes about genetic freaks definitely plays a big role in how many guys can show this kind of growth. Dan Rilely was also very aware of this. He used to say that all of the guys on the team were genetic freaks. A very small proportion of the population has the combination of size, speed, strength and athleticism of major college football players, and only a small subset of that group has the genetic potential to grow in the manner of the three people that I described. To further exemplify this fact, the most challenging times trying to block people I experienced occurred in practice, rather than games and that includes games in which Infaced first round draft picks. I think that the results of the West Point experiment are the most revealing about the validity of using HIT for muscle growth. It was a real experiment that contained a control group and a “treatment group” and the population tested was not chocked full of genetic freaks. Yet, the treatment group had very significant gains relative to the control group. To me, that is the “proof” of the advantages of HIT. This is absolutely fascinating, thanks so much for sharing it here. Do you happen to know the name of the book containing the West Point results? Fantastic to read from someone who was so closely related to the beginnings of Jones’ system. As nowadays it’s been diluted quite radically in some quarters. If you didn’t mind my asking, how did Riley’s weight lifting philosophy compare with those of other colleges? Did other teams give such it the time it deserved or avoid it in favour of more traditional training regimes? Additionally how long did you continue the HIIT method post-college and do you feel it works best in short time periods (1-2 seasons) or is truly a lifelong approach? Thanks once more for your fascinating read! Just so much wonderful information there! The value of intensive exercise during very short time periods has been amply documented, there is a lot of info corroborating your article on the web. Even short, 5 or 10 minute brisk walks interrupting your office work several times a day, are now known to do more for your cardiovascular health than hours long exercizing several times a week. Absolutely and it’s interesting to note the rise of High Intensity Interval training as a form of weight loss during the past two decades. Many now prefer short bursts of activity in place of long hours on the treadmill! 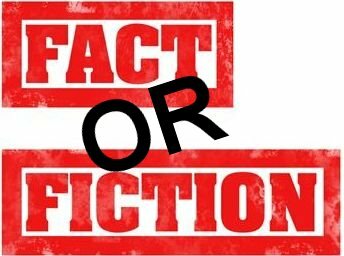 Total fiction, forget the loss of weight due to accident, illness or diet beforehand or whatever else is used as some type of excuse, there is no way that a person can gain over 2lbs of “muscle” per day AND lose nearly a pound of fat per day and be a human being. Not even with the best drugs. It’s amazing that people actually believe an unverified study done by a self-interested person with no research background. Where is the raw data? Where are the methodologies? Where are the peer reviews? Even the follow up West Point study didn’t show anywhere near these results in a 17 week trial. In fact, that study didn’t even attempt to measure fat and muscle loss and gain during the study from what I’ve heard about it. The pictures, one must wonder how long apart and which was really the before and the after, show the classic marketing angles of puffing up, angling, clothing arrangement et al. It’s clear that Viator was already well conditioned and already over halfway through his genetic potential for muscle growth even before the study. It’s also clear that there is no way he is 45 pounds heavier in the “after” picture, nor did he lose nearly 20lbs of fat. Seriously, are people this gullible? Hi DGB, how are you? Thanks so much for dropping by. You have fantastically laid out many of the criticisms and critiques that have been applied to the Colorado Study over the years. The purpose of the article is not to present the study as fact (as I myself am skeptical of the results) but rather to highlight one of the most important ‘scientific’ trials in bodybuilding at that time. This study and the one at West Point were used by Arthur Jones and others as proof that his system worked. What is important is that they appeared scientific, at least by bodybuilding standards, and also heralded in a new training method in the Nautilus era. Jones himself was a highly intelligent man so who knows why these standards weren’t put into place as you point out. Whether or not people are gullible…I think the rise and fall of numerous fitness trends answers your question!! My name is Jimmy Allen, and I trained exclusively the HIT training regime. While in the Marine Corps stationed in South Carolina I would drive down to Lake Helen Fla. and train at the quansat hut, under Author Jones. That was the year Sergio was getting ready for the Mr. Universe. I was 22 years old then. Now I’m sitting on top of 70 year’s. I have had physically degenerating sever arthritis. Both shoulders have been total replacement, hip total replacement and soon too have both knees replaced. I’m into 14th training session as of 11/7/17 my knee supporting muscle tissue has improved dramatically in the 14 workouts. All workouts single primary movement to a compound movement. 12 exercises total. Conor, This is Lou Bartek, the person who played football at Penn State and commented on your blog about HIT and Author Jones. You asked several questions in reply to my comments and I am just seeing them now. I will be happy to address your questions, but prefer not to do it online. So if you respond to me using a private email address, I will do my best to answer your questions about the West Point Experiment etc. Louis R. Bartek III, Ph.D.
Hi Jimmy. How are you? Thanks so much for stopping by and please do forgive my late reply. That’s fantastic to hear that you’re still training. Something for me to aim for! Are you still following a Jones esque plan of training? With modifications of course! 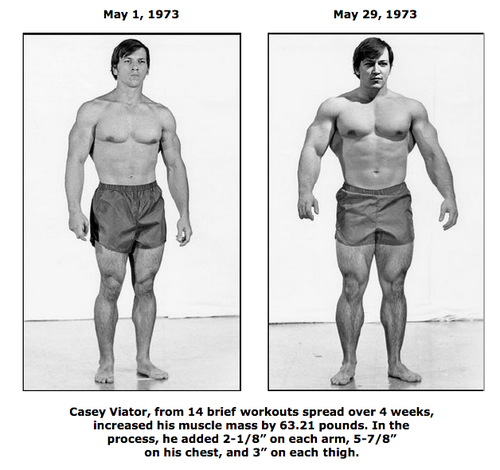 A number of Viator’s contemporaries such as Jeff Everson and Dave Draper have claimed that Casey admitted to steroid use before, during and after the Colorado Experiment. And it is very likely that Jones knew about it and choose to turn a blind eye to it. The weight gain. Just as surely it was not all muscle. Muscle simply does not grow that fast. That is an average of 1.5 lbs of muscle per day. And remember that is muscle (not fat or anything else but lean body mass). I have no doubt that Casey did indeed gain some muscle but most of it was simply gaining back what he had before. As for losing fat, no, that was pure speculation on Jones’ part. How do I know this? Because to lose fat the body must be in a caloric deficit. Casey went from eating 800 to 5000 calories so where is this deficit coming from? Moreover (and this is something rarely touched on) when you undertake a severely restricted diet for for any real length of time, your metabolism slows down. At 800 a day it must have been crawling. But this takes time (1-2 weeks) and assuming that you haven’t permanently damaged your metabolism by said diet it also takes about the same amount of time to get back to where you were before. So for at least the first week, if not longer, Casey was consuming 5000 calories a day on the metabolism of a turtle. By all the laws of human physiology he MUST have gained fat. Even after it picked up, he wasn’t in a caloric deficit because remember he was gaining muscle. Again according to human physiology you can not gain muscle while losing fat AND at the SAME time be in a caloric deficit. Bottom line. Both Jones and Casey had a financial interest in this project. Their claims violated both the laws of thermodynamics and human physiology. Anyone who tells you different has an agenda to push. Oh and as for the football players…As already pointed out they were genetic freaks. They would likely have gained the same mass from any training program. Absolutely right to point this out. Its a pity people haven’t replicated it with more rigorous controls. You’re right to be sceptical on this and it’s well worth remembering that even modern claims of miracle muscle gain are usually suspect! Scroll down a bit less than about halfway to read the interview with Casey. I can’t speak as for the veracity of this site or the interview but from what other people have said about Casey privately admitting to them…it seems in line with the rest. I think Jones was a complete con merchant regarding this ‘experiment’, I have used his machines in the past though and found them of top quality! Hi Nick, I’d agree with you on the weight gain. In particular Casey’s obvious underrating allowed for an incredible weight increase once he began training again. What I do admire about Jones however was his determination to try something new and his eye for new inventions. Have you ever used his Lat Pullover machines? Their gold imho!